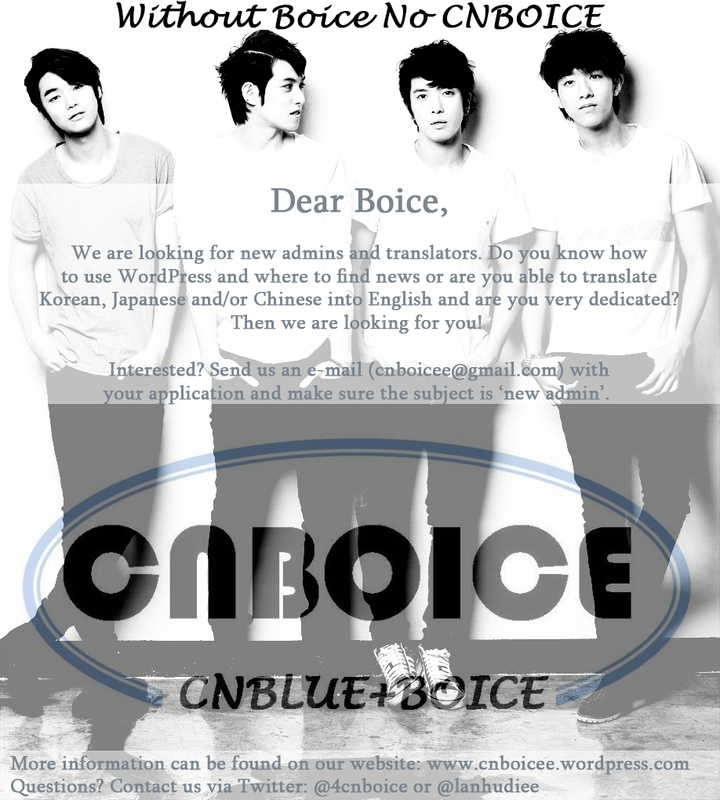 CNBOICE | Because when CNBLUE meets Boice, it creates CNBOICE. CNBLUE new single “WHITE” released April 8th ! A perk for someone who bought CNBLUE’s Single ‘WHITE’ that will be released on Apr.8th. The winner by lottery will invited Premium sign event. (at Tokyo and Osaka). After you bought 3 versions of 4 versions as below, you can apply the lottery. And total lucky 400 fans will be chosen by the lottery for the premium sign event. Categories: cnblue, jung yonghwa, kang minhyuk, lee jonghyun, lee jungshin, news, photo | Tags: BOICE, bpb, CNBOICE, entertainment, fnc, Jonghyun, jung yonghwa, JungShin, kang minhyuk, lee jonghyun, lee jungshin, music, news, tara lee | Permalink. Categories: Uncategorized | Tags: cnblue, CNBOICE | Permalink. Categories: cnblue, news, twitter, Uncategorized | Tags: Asia, Bahasa, BOICE, Chinese language, cnblue, CNBOICE, Google Translate, Korean language, Translation, translator, twitter | Permalink. As of our announcement on official website, by the decision of his military service from March 5th, 2018, Jung Yonghwa is no longer able to take part in this event. We’re sorry, and we apologize for the inconvenience and any troubles/worry that may occurred. Through this sudden decision, Yonghwa himself feels hurt more than anyone, that he’s not able to have a direct greeting to everyone (in) BOICE JAPAN, we will hold this event to deliver the message from Yonghwa himself by the remaining three members to BOICE JAPAN. From now on, we sincerely ask for your continuous support to CNBLUE, and we thank you all for your understanding regarding this matter. Jung Yonghwa received a notice of enlistment from Korea Military Service Agency and will join on March 5th, 2018. Lastly, we will cancel all schedule of overseas solo tour which is scheduled after January 27th, as of Hong Kong stop of “2018 JUNG YONG HWA LIVE [ROOM 622].” We appreciate your understanding, to our fans domestically and overseas. For another solo tour that may be planned in the future, we’ll do our best to ensure that there’s no inconvenience to our fans through an appropriate procedure. In addition, regarding to CNBLUE’s Japan Fanmeeting that has been announced, we inform again that the event will be hold without Jung Yong Hwa’s participation. After fulfilling the military service as a duty of a citizen by the call of the country, we ask for the support so that he can come back healthy and more mature figure. Categories: cnblue, Japan, jung yonghwa, kang minhyuk, lee jonghyun, lee jungshin, news, Official Statement, Translation | Tags: cnblue, CNBLUE Official, Japan, Japan Fanmeeting, Jonghyun, JungShin, Minhyuk, official, Yonghwa | Permalink. Categories: Japan, Lyrics, STAY GOLD, trans, Translation | Tags: cnblue, Lyrics, Only Beauty, STAY GOLD, trans, Translation | Permalink. CNBLUE is about to release their new album “STAY GOLD” on October 18th. To celebrate its release, they held a LINE LIVE Broadcast on September 14th. Moreover, they used a theme from outdoor in order to match their album, so called “Glamping”*, which made it looks a bit different. *T/N: I wrote Grandping before, so its a Glamping actually (read about Glamping here). Thanks Mori Na Joven for the suggestion! It was taken from somewhere in Tokyo. Lee Jungshin said “It’s cool and good~”, while Jung Yonghwa admits that “The atmosphere is similar like Busan in South Korea”, members said that its their first time to come to a place like this in Japan. Started form a toast! Which non-alcoholic said “I’m drunk already”!? The theme of “STAY GOLD” is Glamping, so we started with a toast from carbonated water. In spite of being a non-alcoholic, Lee Jungshin closed his eyes and say, “I’m drunk already~”, Lee Jonghyun shows a unique face, and suddenly 4 of them goofing around and act like a clown. Since it’s a Glamping, we prepared a high-quality meat to be served for the BBQ section. We challenged CNBLUE members to decide “who knows the difference” by drinking a tea and make a comparison of it, and those who can answer correctly can eat the meat. Each of them should drink a lot of tea (different kind of tea) and need to find a correct answer, and answer it firmly. While they’re in a hesitation (after tasting tea here and there), and neutralize their taste with pure water, only Lee Jonghyun who confidently said “It’s absolutely this one! I’m a cook. I think I’m right”. Since the opinions among them all are split (different), the answer is decided through a majority by vote. When you go to the grill and started to cook the meat, be sure to watch a precious yet valuable cuisine scene, such as Lee Jungshin’s blood vessels while shaking his hand on pouring the salt, and Jung Yonghwa who’s pouring the salt in a manly way. Kindly check it out on the broadcast! Even Kang Minhyuk surprised by the sudden flame and shouted “Hot!”, Lee Jonghyun managed to cut the meat and delivered it to the members, the meal served safely. Jung Yonghwa and Lee Jungshin argue with “Aaa~” “Don’t give it up”, and made a perfect service shot. A pride of “cooking man” goes to Lee Jonghyun who silently taking care of the foods. About the recent private (schedule), Jung Yonghwa said “I tried surfing for the first time, but it was fun to make it (to be able to surf) quite quickly”, meanwhile Lee Jungshin, “I’d like to go on a trip to various places in Japan. Especially, I’d like to go to hot springs, and go out for the dinner/meal (there) also”, Kang Minhyuk said, “I wanted to go to the sea this summer, but….” “There are a lot of work to be done, so 4 of us aren’t able to go out easily. But, recently I went to Hawaii, so I just want to go there with the other (members)”, Jung Yonghwa added. Talking about the new album “STAY GOLD”! Regarding the new album “STAY GOLD”, Kang Minhyuk said, “Its perfect to listen to J-POP in autumn and make songs in Japanese like “Only Beauty”, Lee Jungshin and Jung Yonghwa were looking forward to the live version of “Starting Over” that seems to be exciting, Lee Jongnyun said, ““Butterfly” was made by Yonghwa, but I like songs that I made,” he recommends respectively. Jung Yonghwa keep looking back to the time when they are recording (the album) and said, “There are many songs that I sing for the first time, its fresh and challenging”. Just before the program ends, a polaroid photo was taken and (the broadcast) reached 10 million hearts. The polaroid will be given to fans, with a signature of the members on it. There are a lot of CNBLUE expressions that can only be seen here, such as their enthusiasm for the tour, and their cute expressions while using “SNOW” features. Don’t miss it! Categories: cnblue, Japan, jung yonghwa, kang minhyuk, lee jonghyun, lee jungshin, live, trans | Tags: cnblue, Japan, Jonghyun, Jung Yong Hwa, JungShin, Kang Min Hyuk, Kstyle, Lee Jong Hyun, Lee Jung Shin, LINE LIVE, live, Minhyuk, STAY GOLD, Yonghwa | Permalink. Jung Ilwoo, Ahn Jaehyun, Lee Jungshin (CNBLUE), Choi Min, and young actress Park Sodam appeared on a drama that has become a hot topic, “Cinderella and The Four Knights <Knight>”. To celebrate the DVD release this spring, “Cinderella and The Four Knights <Knight>” DVD event was held on Saturday, July 22nd at Sumitomo Real Estate Shibuya Garden Tower. By the invitation of the moderator, Lee Jungshin, who wore a stylish casual fashion with Ahn Jae Hyun, who dressed in an olive-colored shirt, were stand out and appeared on the stage which makes the fans’ cheers risen. Q. Please greet everyone first. Jaehyun: Hello. I’m Ahn Jaehyun. I’m looking forward to meet you. Jungshin: Hello. I’m Jungshin. Thank you so much for coming today. Q. Although it’s a DVD event of “Cinderella and The Four Knights <Knight>” which has been released in April, how are you feeling now? Jaehyun: There are so many fans of Jungshin (laugh). But, thank you so much for coming today. Jungshin: I’m really happy. It’s like a feeling when I took a drama for the first time in a year. Q. When did you two come to Japan? Jaehyun: We came here by the same plane yesterday at around 11PM. Q. Jungshin just finished a fan meeting few days ago. Jungshin: It was my first solo fan meeting. I had a really good time, I went back to Korea for a while, and here I am come back again with this promotion. Q. I think Jaehyun has started to shoot a new drama “Reunited World”, does the shooting doing good? Jaehyun: I’m doing my best in filming my new drama, but I’m glad that there’s an opportunity to meet Japanese fans like this. I really happy because I think this is the first time I see/meet my fans again since “M COUNTDOWN”. While watching the clip of the drama flowing on the scene, I looked back at the story behind it’s filming and the episode at that time. Q. At first, there were scenes where three of you, Jiwoon, Hyunmin, and Seowoo appeared riding a car, how was it to play/portray the life of a chaebol? Jungshin: Looking at the previous appearance scene, I think that it would’ve been better if Jung Ilwoo sunbae was with me. Q. Hyunmin was set as a sloppy person to a woman, what did you do to create/make that role? Jaehyun: AHAHAHA (laugh). It was very difficult. I got a lot of advice from great men around me and those who have had a lot of experience in love. Q. Seowoo is set as a popular artist, does that mean Jungshin no need to create/make a role for it while you usually having activities with CNBLUE (as a popular artist)? Jungshin: When I first heard about the role of Seowoo, I thought that there are many similarities (of him), such as my tone of voice and my usual appearance(s). When I do acting, I play/portray it in a slight more enjoyable tone than I usually do, I thought that natural feeling is best rather than have to create/make a role. Q. Are there any episode(s) which has a scene where all casts are complete? Jungshin: I think there are many scenes where actors gather in this drama. The scene where we play together was fun, since the age gap between us were close, I enjoyed the filming. Jaehyun: Jungshin had been thinking a lot about ad lib. Jaehyun: Jungshin really has a sense of humor. Q. In the scene where Seowoo’s mother came up to meet him, it’s very impressive that it looks like (both are) good friends, but did you talk about something before you’re about to act together? Jungshin: I was glad that I’m able to see Lee Ah Hyeon *actress who acts as his mother* as a mother role this time, in a short drama I appeared before she also played a mother role of mine. My breath was perfect, and my senior can take the lead, so it was fun when filming. Q. Do you usually have a feeling like this with your mother? Q. On the scene where Hyunmin depressed because of Hawon, I wonder if the leaves are prepared by the production team or is it an ad lib? Q. I saw there was a scene where Seowoo said sharp words from fans, does Jungshin sometimes make lyrics based on what he experienced? Jungshin: Sometimes I write based on what I’ve experienced, whether its direct or indirect (experience), sometimes I may imagine or exaggerate it. Jaehyun: (looking at the paper where the handwritten lyrics was written) Is this Jungshin’s letter? Q. How did you manage to play/portray the scene of Hyunmin and Hyeji? Jaehyun: I really like Hyeji, he looks like an adolescent boy who has his own favorite (friend), I strongly tried to express for having a cold attitude since I don’t want my feelings to be known. Q. Next one is about the scene where Hyunmin and Seowoo were having a negotiation, it’s very interesting, but did you two talks about acting (outside filming)? Jaehyun: Of course, having a beautiful scene with an actress is also good, but I can (also) enjoy (for having) such a negotiation between men (actors). I think it will be good if there were more negotiation like that (on the scene). Jungshin: On that scene, I think there were quite a lot of my ad libs rather than the script one. Jaehyun: It’s also a scene where each of our characters appeared well. Seowoo is gentle/kind, with a role to cook/making dishes, and I think that Hyunmin is represented as the one who try to solve anything with money. Q. At the end, what kind of work do you think this drama about? Jaehyun: I watched a lot of cartoons and animations when I was kid, but I think this drama could be represents/reproduce as the world of girls’ manga. Jungshin: I think this drama has that romance (feels) and a little bit like manga. Of course, I’m not 100% satisfied, but there are parts that I think I could have done better, but I really enjoyed the filming. I guess I feel more comfortable playing in a casual drama rather than a drama that has something like a deep meaning. Next is a quiz corner to know more about these two people. They also talked about some episodes with their co-stars and their own personal parts. Q. It’s going to be on fire/hot/competitive on winning the game. Me too. It’s good to be peaceful and calm. It’s such a principle. Q. I have a certain favorite style to be worn by women. If a girl wears clothes based on her mood, I think it’d be better. I think a style like turtleneck and thin scarf is cute. I don’t even know whether my face is swollen or not. Jungshin: AHAHAHA (LOL) I always ask “Does my face swollen?” to make-up artists and staffs before work. I’m a man after all, sometimes I don’t care about such things, but there are parts that are insensitive/insensible to small changes. Q. In fact, I’m good at cooking and there are some cuisines that I can make it well. Since I was living in a dormitory with my members, I guess I cook more than men do in regular. But I’m happy to see the manager and other members eat my dish deliciously. Grilled meat, miso soup, and kimchi fried rice are simple and easy to be made. I want to go to cooking school in the future. I’d like to ask for a school recommendation from Jaehyun hyung (laughs). Jaehyun: In fact, there was a dish where I have to handle the fish in the school, it was fade out to the machine. I was really afraid to take out the internal organs (laughs). Q. Who was faster to switch (personality) from on and off screen? The image of Ahn Jaehyun as a character on the drama and his original appearance(s) are different, attentive to everyone (staffs), polite and I think that it’s a way to approach them. Although I thought that there was also a hard part to start approaching an older senior, but in fact it’s not a problem and they all are very kind. Q. Who has the closest connection to their role? It was a really cool role, I think he was made to play that role. There are some funny parts that seems to be missing a bit, but his usual appearance was really similar to the role. Q. Who is supposed to be the real Knight? Seowoo was trying to protect someone he really loves and throw away the honor. I thought that a Knight is the one who would protect the bonds with the loved ones rather than to work. I thought that there are parts that similar to the real Jungshin (in real life), and I choose the romantic part. Hyunmin will protect Hyeji who he loved since first until the end. There was a part where everything can be solved with money, but actually the best way is to protect her. Hyunmin only know to solve (everything) with money, so when he did (something for Hyeji without money), he devoted himself to keep the loved ones, so I thought that’s a Knight. In addition, a surprise cake was prepared for Ahn Jaehyun who celebrate his birthday on July 1st. He thanked fans at the event and said, “I had a chance with you all to celebrate my birthday like this by the prepared event, so I thought I have to work harder. I hope I’ll have a chance to meet the fans again in the next work/project. And I hope I can be a co-star again together with Jungshin”. “Thank you so much for supporting “Cinderella and The Four Knights” as of today. I’m happy to see you all in such a wonderful event. Please support (our) future activities as well. I’d be happy to take care of myself so that I can meet you all again”, said Jungshin showing his feelings word by word politely in Japanese. Ahn Jaehyun and Lee Jungshin are good friends just like real brothers. A mutual relationship that began to grow through a drama was brought up to such a heartwarming event. Categories: cinderella and the four knights, drama, interview, Japan, lee jungshin, trans, Translation | Tags: Ahn Jaehyun, cinderella and the four knights, Jaehyun, JungShin, lee jungshin | Permalink. ※ BOICE Limited Edition will be available only for BOICE JAPAN members. After this item has reached it’s limited amount of reservation, the reservation/orders will be stopped/discontinue. ※ After purchase, address change is possible only during it’s period, it can be changed from the details of MY PAGE’s “Purchase History List”. * Please note that we can’t accept changes after the deadline. Items will be delivered after the release date. Customers who applied/ordered after August 2nd,2017 will be delivered one week after the application date. ※ For delivery, we may not be able to deliver (on time) in case if forced by the stock (and situation) and the delivery status of the products may subject to change without notice. Furthermore, if you order this product after the sale date/release date, it won’t be shipped on the same day. ※ This product can’t be purchased together with other products. Please be careful when you are considering purchasing other products. * Cancellation after ordering can’t be accepted at all. ※About the arrival and delivery status of goods, there (might be) a force which make it can’t be delivered prior to the Release Date. ※ BOICE Edition is limited only for CNBLUE OFFICIAL FANCLUB [BOICE JAPAN] members. If you wish to purchase, please join from http://fc.avex.jp/boice/. Please contact us from here for purchase inquiries. Categories: Japan, jung yonghwa | Permalink. CNBLUE’s Kang Min Hyuk mentioned Lee Seung Gi. CNBLUE drummer Kang Min Hyuk told the Lee Seung Gi’s story in ‘Video Star’. Kang Min Hyuk has met with Lee Seung Gi in the movie ‘Marital Harmony’ which is scheduled to be released in the second half of this year. Kang Min Hyuk said, “I was nervous because that was the first time I was filming a historical movie” he said “I was really grateful that Seung Gi hyung made me feel comfortable as well as acting advice”. Kang Min Hyuk is an actor who has acted with actresses such as Park Shin Hye, Moon Chae Won, Oh Yeon Seo and Hyeri. Kang Min Hyuk said “Among the actresses I worked with, SooJung-ah (Krystal) was the best. She was really cute like a sister” and he showed affection for Krystal. The episode will air on July 11 at 8:30 PM. The Korea Trade-Investment Promotion Agency (KOTRA) will host the Korea Brand & Entertainment Expo 2017, which will be held in Hong Kong from July 12th to 14th at KOTRA headquarters in Seocho-gu, Seoul, with the singer and actor Jung Yong Hwa as ambassador. Jong Yong Hwa is a actor and leader of K-Pop band ‘CNBLUE’ who has gained popularity in Chinatown and ASEAN region through active music and film activities. Jung Yong Hwa, who starred the Hong Kong film ‘Cook Up A Storm’, broke the box office of 16 billion won in five days, and the album ‘7°CN’, released in march of this year, also ranked first in the iTunes charts in nine countries including Hong Kong, India, Thailand and Vietnam. KOTRA plans to host two Hallyu expositions in Taiwan (June 22 to 24) and Hong Kong (July 12 to 14) to provide a bridgehead for expanding the export of promising consumer goods to the chinese market. In the second half of the year, the company plans to host one or two Hallyu expositions in ASEAN, Indonesia, to support the diversification of the consumer goods export market. Jong Yong Hwa will be a public relations ambassador for Hong Kong Hallyu Expo. ▲ Promoting public and domestic media before and after the event ▲ Maximizing the advertising effect on the event site and our company through special performances of opening ceremony, fan signing and company booth visit ▲ Local social contribution activities. President Kim Jae Hong said, “Hong Kong is the leading source of the trend of consumer goods in the Middle East and is a major hub for the Korean Wave as a super connector connecting the mainland and the world” and “As Jung Yong Hwa, who is loved by the chinese region, has been promoted as a public relations ambassador, we hope that the Hallyu Expo will further promote economic and cultural exchanges between the two countries”.